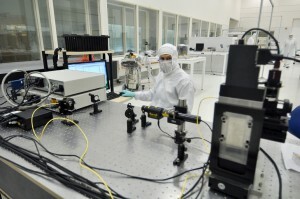 Environmental pollutants, such as dust, particles, and vapors, are an important consideration during the development of space instruments and components; a stray dust particle or fingerprint could disrupt or disable scientific instruments. NASA and other agencies have strict guidelines concerning the level of allowable contamination for space-bound products. LASP’s four on-site cleanrooms—special rooms with controlled levels of pollutants—allow us to meet those specifications. Cleanroom standards are federally and internationally regulated and designated by class, which is an indication of the size and number of particles allowed per volume. For example, an International Organization for Standardization (ISO) Class-5 cleanroom has at most 100,000 particles bigger than a tenth of a micron per cubic meter. Or, a Federal Standard Class-100 cleanroom has at most 100 particles bigger than half a micron per cubic foot in a cubic foot of air. Depending on their class designation, LASP clean rooms have special systems and features to control contamination. These may include isolated air filtration, humidity, and temperature systems; anterooms for staff entering and exiting the cleanroom; and special protective clothing for workers, including coveralls, shoe covers, facemasks, gloves, hairnets, and goggles. Equipment inside the clean rooms is also controlled so that it does not generate air or particulate contamination. One of the challenges in developing spacecraft is the space needed to manipulate the components during assembly. LASP’s on-site high-bay cleanroom allows our engineers the flexibility to engineer large spacecraft. This Class-10,000 cleanroom also has a large control room, a vacuum chamber room for environmental testing, an ante-room for staff to don cleanroom suits, and a cleaning room.